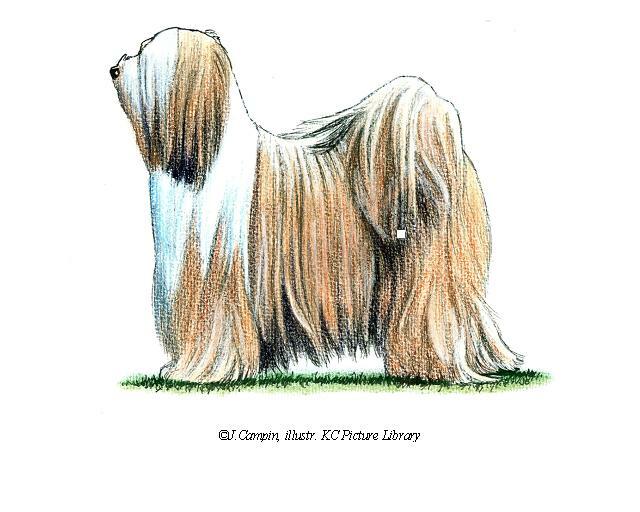 : In spite of the name, the Tibetan Terrier is not a terrier but a herding dog, doubling as a guard for traders as they journeyed to and from China. It succeeded in his job not so much by size but through the awe in which he was held. This is believed to be the original Holy Dog of Tibet. It is said to be even livelier than the other Tibetan breeds in Group 9, his energy and enthusiasm balancing his ability as a miniature guard dog along the lines of a small Old English Sheepdog. : Sturdy, medium-sized, long-haired, generally square outline. : Length from point of shoulder to root of tail equal to height at withers. : Lively, good-natured. Loyal companion dog with many engaging ways. Outgoing, alert, intelligent and game; neither fierce nor pugnacious. Sparing of affection to strangers. : Head well furnished with long hair, falling forward, but not over eyes, and not affecting the dog’s ability to see. Lower jaw carrying small, but not exaggerated amount of beard. In all giving a resolute expression. : Of medium length, neither broad nor coarse, narrowing slightly from ear to eye, neither domed nor absolutely flat between ears. : Marked in front of eyes, but not exaggerated. : Strong. Length from eye to tip of nose equal to length from eye to occiput. : Lower jaw well developed. Incisors set in slight curve, evenly spaced and set perpendicular to jaw. Scissor or reversed scissor bite. : Zygomatic arch curved, but not overdeveloped so as to bulge. : Large, round, neither prominent nor sunken; set fairly wide apart; dark brown. Eye rims black. : Pendant, carried not too close to head, V-shaped, not too large, set fairly high on the side of the skull, heavily feathered. : Strong, muscular, medium length, allowing head to be carried above level of back and giving overall balanced appearance. Flowing into well placed shoulders. : Well muscled, compact and powerful. : Fair spring of rib with depth of brisket to elbow. Ribbed well back. : Medium length set on fairly high and carried in a gay curl over back. Very well feathered. Kink near tip often occurring and permissible. : Well laid with good length. : Good length and slope. : Legs straight and parallel. : Large, round, heavily furnished with hair between toes and pads. Standing well down on pads; no arch in feet. : Heavily furnished, well muscled. Well bent stifles and low set hocks giving level topline and drive. : Smooth; effortless drive with good reach; powerful drive. When walking or trotting hind legs should track neither inside nor outside the front legs. : Double coat. Undercoat fine and woolly. Top coat profuse, fine but neither silky nor woolly; long; either straight or waved but not curled. : White, golden, cream, grey or smoke, black, parti-colour and tricolours; in fact any colour except chocolate or liver permissible. : Males 36 - 41 cms; females slightly smaller.